Magic Books I did some time ago for a training. I was saving them for later, but realized they were just abandoned in some folder. 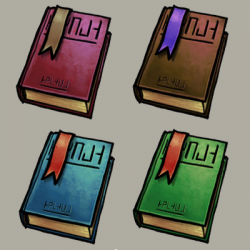 Nice tomes you got there. Thank you for sharing these. "Nice tomes you got there. It'd be a shame if something were to happen to 'em." I will be using this in a school project ware i am designing a tower defense game based on school thanks. Nice made, i will be using these (this) in my second game for the AppStore! I used this asset in my android game Doodle Wizards, very useful. Can I use your art for a simple game I am making? Let me know when you're done, I'll be glad to see it in use. Here's a screenshot of the game I coded.